Only one stopService() call is needed to stop the service, no matter how many times startService() was called. The two modes are not entirely separate. You can bind to a service that was started with startService(). For example, a background music service could be started by calling startService() with an Intent object that identifies the music to play. Only later, possibly when the user wants to exercise some control over the player or get information about the current song, would an activity establish a connection to the service by calling bindService(). In cases like this, stopService() will not actually stop the service until the last binding is closed. 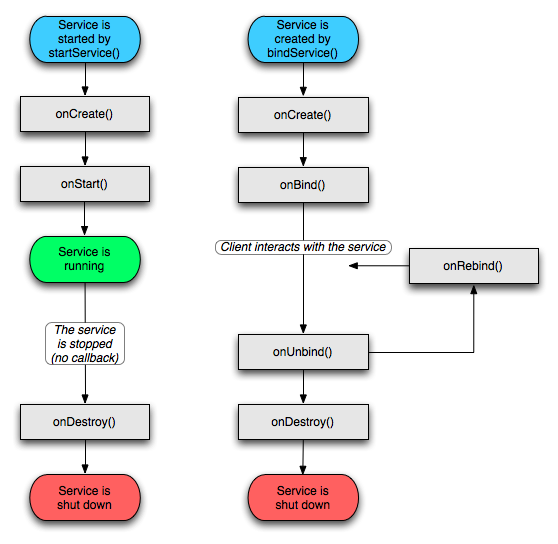 However, onStart() is called only for services started by startService(). The onBind() callback is passed the Intent object that was passed to bindService and onUnbind() is handed the intent that was passed to unbindService(). 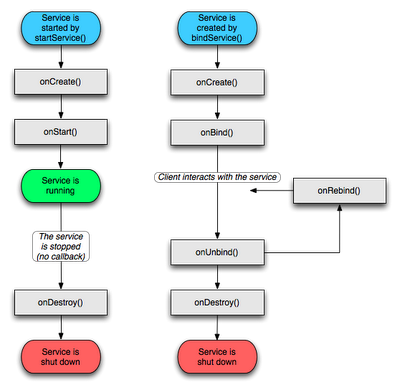 If the service permits the binding, onBind() returns the communications channel that clients use to interact with the service. keep in mind that any service, no matter how it's started, can potentially allow clients to bind to it, so any service may receive onBind() and onUnbind() calls.